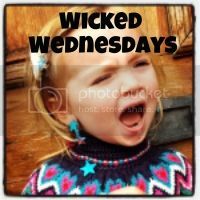 This week my #wickedwednesday post fills me with dread: Toddler H has discovered the battery compartment on remote controls…. and can open them. She discovered this once before we went on holiday and I hoped she’d forgotten and that was that. But no, we got back last night and just 15 minutes ago, sat beside me, tired and refusing a nap, she picked up the remote, turned it over and opened it up. Just. Like. That. I, of course took a photo and grabbed it off her in one fail swoop. H is so dexterous, so determined and so full of tantrums if I take the remote off her. I’ve read so many horror stories of children eating batteries, I’ve worked in a field that revolves around poisoning and safety! Goodness knows where we can now keep the remote controls, or maybe we’ll try good old Sellotape. Why do I have recollections of grandparents remote controls covered in tape? Did remotes just break easier, or was it because they too were scared WE would eat the batteries? I can’t remember, but I’m more than happy to try anything. hehehe! I used to have really strong tape on my TV remotes…My eldest was obsessed with getting the batteries out. Oh gosh that’s crazy! They just figure things out so quickly don’t they? O my goodness! My little boy is 10 months and has started his throwing phase! He is completely obessed with the controllers and however much i move them he has to have them – the tantrums have started! He throws them now and the batteries literally fall out! I’m living in a cycle of, move controller, baby screams and grabs it, throws it, batteries fall out, I put batteries back in.. etc. I’m starting to question whether I can live without the remotes during his waking hours. That’s exactly the same as we had at that age. We put them in a tub behind the sofa as she’d pull cushions off to find them. They are little monkeys aren’t they!